Description of "A TALE OF TWO COUNTRIES"
This is the story of a little boy growing up in a remote village and then in a Tea Estate of Assam. The story moves to a college hostel and then to Moscow and finally to Mumbai via Delhi. It talks of people, some honest and others not so, about the unjust system here in India and there in Moscow. In between there are many anecdotes, laughter, joy and happiness. Although narrated in the first person, the protagonist of the story is not one individual; he is a mix of many persons. Readers may be able to identify some of the characters, but they are all imaginary. Actually there is little difference between life and fiction! I hope readers will enjoy. Dr. Dipak Kumar Chakrabarty retired as a Professor of Indian Institute of Technology, Bombay. Since then he has been Visiting Professor at several IITs and Universities. IIT Bombay has honored him with the title Professor Emeritus. He has authored several books and many research papers. This is his first book of fiction. He lives in Guwahati with his wife. 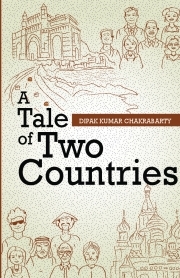 Reviews of "A TALE OF TWO COUNTRIES"